Remember a month ago when Luc Richard Mbah a Moute had some issues with the NBA and its “non-concussion” policy? Apparently Commissioner David Stern and the rest of the NBA took notice; as today we have found out (via AP writer Colin Fly), the Association is in the process of adopting a policy/protocol for concussions. The move would bring the NBA more in line with both the NHL and the NFL. In just the last four weeks, at least six NBA players have missed games because of concussions or concussion-like symptoms. Right, studying this for several years? 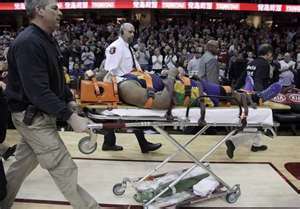 Mbah a Moute makes a very clear and valid claim, then one of the Association’s top stars gets hauled off on a stretcher. Now is when the NBA says they have been studying this for “years”. Good to see they are willing to do something regarding the issue, but nice try on the snow job, at least you can be commended for doing something, just get it right.